Yet another football game called Kick Off. This one is simply a revision of the classic rummy card game. 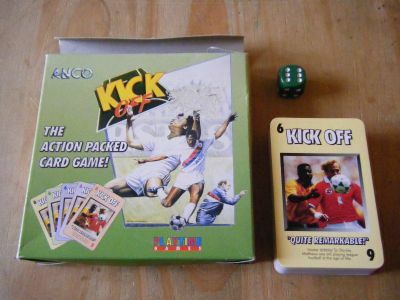 Get dealt cards and try and make the best set of hands that you can and then compare them - the winner scores a goal. Sort your hand into the best sets of 3 cards - prial, run, flush etc and then compare the hands in descending order - winner scores a goal using the dice.